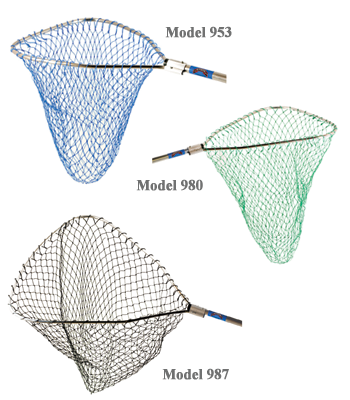 The Big Game landing nets have space-saving sliding aluminum handles and deluxe rubber grips for total control. 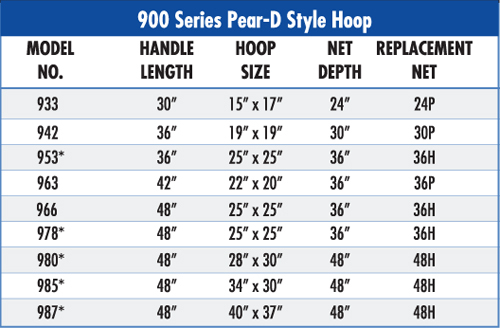 *Models 953, 978, 980, 985 and 987 feature strong diamond-embossed 1-1/4″ handles. These models also feature a heavy-duty 5/8″ aluminum hoop that has 8″ reinforcements at the critical stress points for added strength. • Longer one-piece handles up to 12 feet long (add length in feet after model number). • Two-piece telescopic handles up to 22″ long (add “T” and desired length after model number). The thick 1-1/4″ diameter, unbreakable American made fiberglass handle can slide up into the hoop or it may be removed for easy storage. 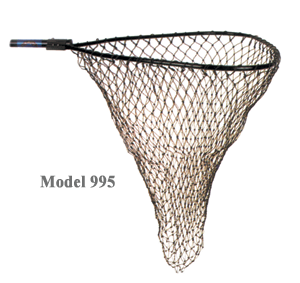 These models also come with deluxe rubber grips for total control, a 5/8″ reinforced hoop with heavy-duty netting, and an unconditional guarantee.